This is my Epiphone based DIY Custom African Mahogany Explorer with P-90's that I built.. Lots and lots and lots of lacquer. I replaced the pickups and wiring harness that were labeled Epiphone and used a roller bridge. I also put in 500k pots..So I replaced most of the hardware The tuners felt good so I kept them. The Explorer kit came routed out for humbuckers so I used Humbucker sized P-90's. It was a lot of fun to build, even with all my screw-ups it still came out , the neck is fantastic and sounds really great! So.....is this a kit guitar or did you buy an Epi and rebuild it? 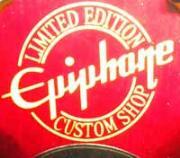 It was a kit that had Epiphone hardware. After examining how the body and neck were shaped it looked more like an Epiphone than a Gibson. Gluing the neck in place was scary because if I didn't do it right the Explorer would have been toast. I was very anxious to start the finishing process. There are a lot of different guitar kits out there. The ones with set necks are the most difficult. The bolt-on neck kits are easier because you can work on the neck and body separately. Like two separate projects. Very nice. What did you finish it with? Lots and lots of lacquer. Not something I would want to do again with my environment for painting.. I think I got severe brain damage.. The trick finish is "Nitro" like Gibson uses, or Resin is faster which is what Epiphone uses I think.. The basic process is sand it, stain it, sand it, seal it, sand it, finish, sanding in between coats, then sand sand sand and polish out..
Explorers are very fun to play, they are very long guitars but extremely well balanced. Gibson released them in 1958 and took a big dive on them. Not realizing they had designed one of the greatest future shock guitars that everyone and their brother would copy, due to lapse in Gibsons judgment and patent. Any Explorer, that follows the Gibson design closely, that is well made no matter who makes it, holds its value, it is truly an iconic design. I have recently added a Duesenberg Trem II Tremolo to mine, it requires no mods to the guitar just takes the place of the stop bar. I asked about the finish as I'm considering trying to do it myself. I have a USACG strat at the moment which is going to go to a finisher because I'm not set up for it yet. Kudos for doing it, I had heard it's a lot of work. Looks like it came out well. And I do like Explorers, they appeal to the Glam rocker in me, having been an early fan of Sweet and Slade and the like, but now that I'm an old blues noodler I can't really justify one. These finishes are all very toxic and a well ventilated spray booth is the best. In addition you need a respirator. Way more toxic than using spay enamel which will not setup into a hard finish like lacquers. Lacquer dries really fast but requires lots of coats to achieve a finish thick enough to be sanded smooth and rubbed out. Nitrocellulose lacquer also dries very quickly and builds up a very hard thick finish faster than lacquer. But with age you may see the spider web cracking that you see typically on old Gibsons. Polyurethane builds up nice finish quickly and sets up in a few hours in between coats. But takes much longer to cure into a hard finish. I used lacquer in a covered wide open space that had a mild consistent breeze, I was always up wind of my guitar, but that was not enough even applying very quick thin coats. I had to get a respirator. It would be easier to finish a bolt on style body that you can lay down flat to get a good flood coats. Mine came from BYOGUITAR at the following link. 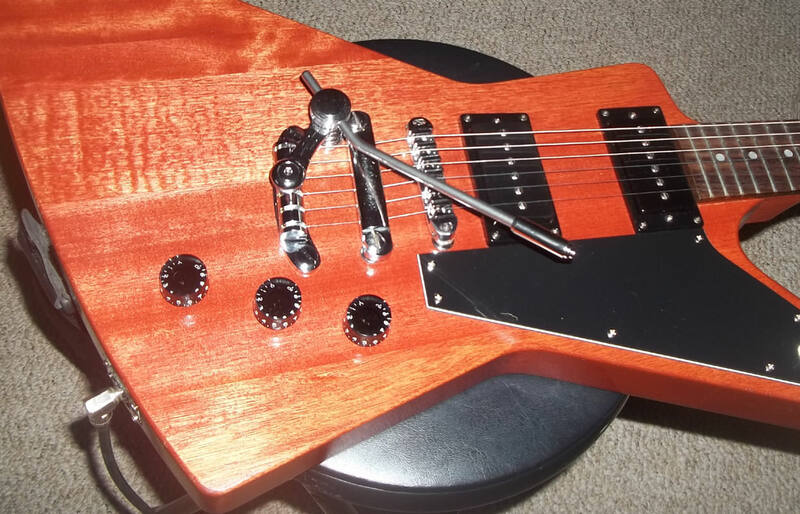 note that kits with bolton neck kits are usually a little easier to build than set necks..
eBay also has Lots of DIY kits..
A better shot of my custom built Explorer..
How do you like the Duesenberg tremolo? How well does it hold tune and how much range can you get? Can you do dive bombs with it? I want to put a tremolo system on one of my Explorers and have been thinking about a Floyd Rose FRX. about the trem, they are really more like Bigsby units.. so I don't think the "Dive bomb" thing is happenin here. There was a demo that I found a few weeks ago, the tuning stability was quite good, excellent infact. I think it's on YouTube.. The Duesenberg Les Trem II works really well, very solid piece of German hardware, they are designed to replace the stop bar without any additional mounting screws. I wanted a left hand tremolo on my right handed Explorer, kind of Stevie Ray style. 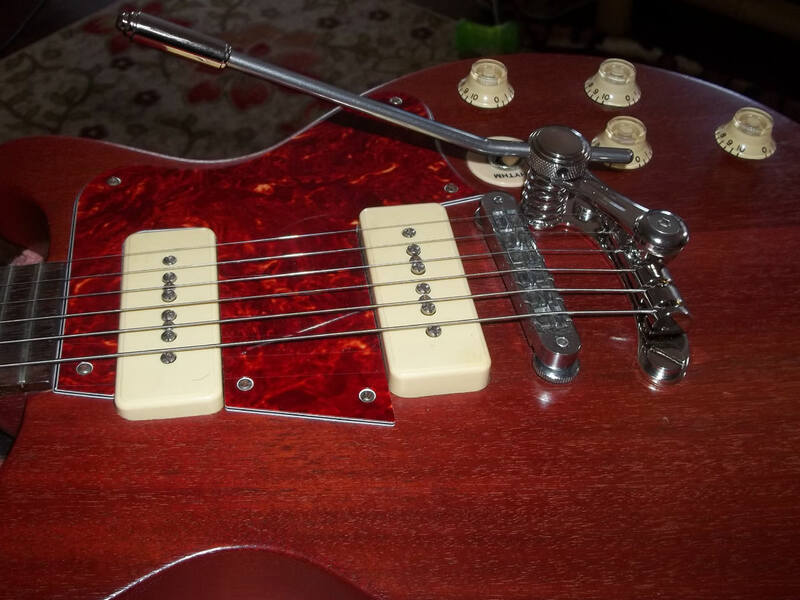 The first time I Installed it, replacing the stop bar, the left handed tremolo spring was a bit too close to the bridge, but it worked fine. So, I added 2 threaded inserts so I could mount farther away from the bridge and used my stop bar to make better angle for my strings on the bridge. 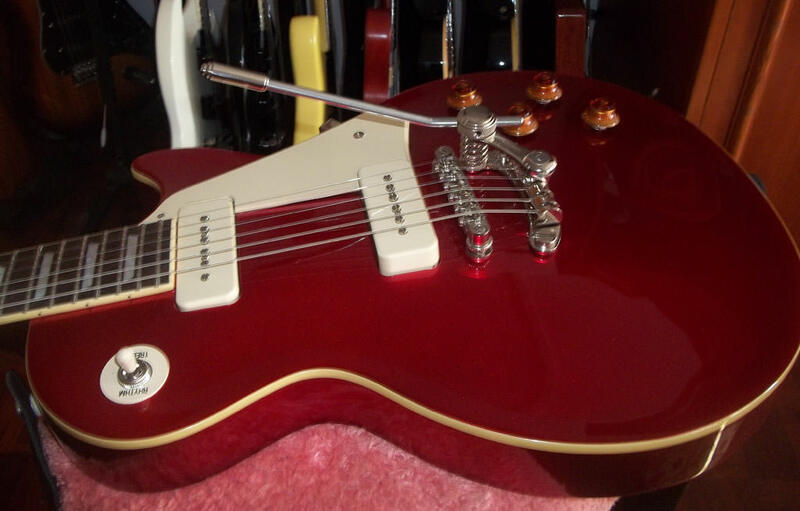 Below is a RH Les Trem II on my RH Les Paul (correct way to install it). Very easy to install just replacing the Stop bar. If you notice that the Dive Bar is round, angled and held in place with set screws. It is very versatile for placement allowing for pretty extreme attack. When the bar is set for maximum dive you can get almost an octave down. I have beat the hell out of my Les Trem II's and they always come back for more. Notre the Duesenberg Les Trem II come with SAE and Metric mount screws, as well as spacer washers for mounting on a contoured surface. Indeed,, that Les Trem looks interesting, I just may have to try one! I decided to move my new Les Trem II to my 56 LP Standard for a while.. But I still like my unorthodox use of a Left hand tremolo on my Explorer.. While I could not recommend this type of install because it requires additional threaded inserts, it works really well. Nice job! Great looking little rocker. 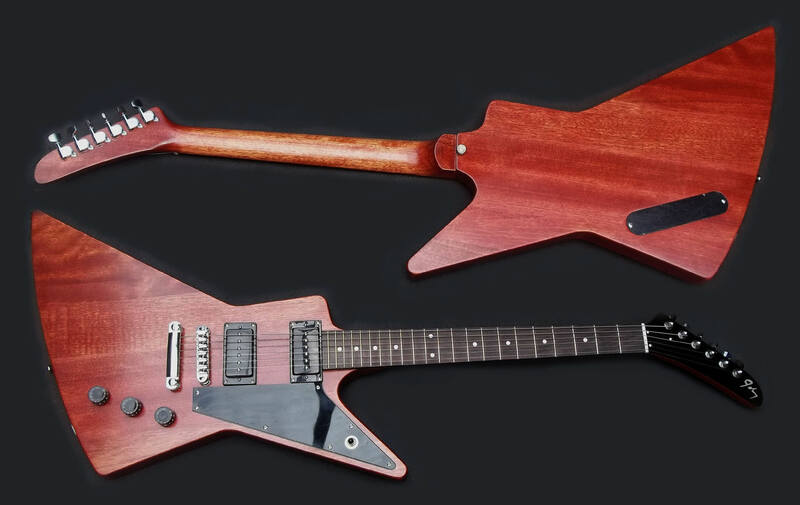 I have always liked Explorer style guitars but have to play them standing as sitting never worked out for me. I'm a little surprised at your choice of lacquer for the finish considering what you have said about the finish on your Blueshawk checking. But I'm sure you had your reasons. Good looking guit anyway you cover it. I have found Explorer's to be comfortable sitting on a couch with the lower notch resting on my knee, but I often use a bar stool as well. I finished my Explorer before I got my Gibson Blueshawk and the finish started to fracture really bad. Although after applying lacquer to the Explorer the long exposure to fumes, even out doors, left me with quite a few less brain cells. If I finish another guitar I will use polyurethane like Epiphone so it will survive the high humidity here on the Island.